Keep an eye out for my collaboration with O, Miami this month! ¿Para llevar o para tomar aquí? considers the social nature or sharing a box of the pastelitos that Miamians know and love, wrapping that sweet and savory goodness in poetry on paper. Stop by Gilbert's Bakery on 57th Ave. and Bird Road and you can get a poetry-wrapped pastelito of your own throughout the month of April! 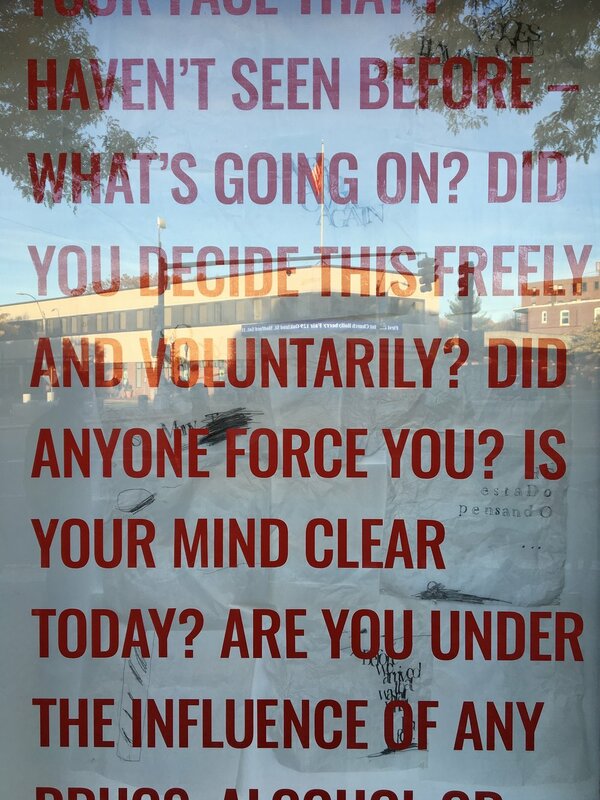 What a wonderful semester it has been to engage with students, faculty and visitors to SMFA at Tufts about translation, its challenges, its pitfalls and its role in the law. Let me explain to you what this means is up until April 27 at both Tufts University in Medford and The School of the Museum of Fine Arts in Boston. Stop on by! I'm thrilled to be exhibiting some new video work as part of Cosmik Debris at VSOP Projects in Greenport, New York. If you didn't make it to the opening, the show will be up until December 9! Looking forward to participating in SFAI140 tonight at the Santa Fe Art Institute, an evening of open studios, talks, and performances open to the public! Open studios begins at 5:30 p.m. and the talks begin at 7:00 p.m. Join us! 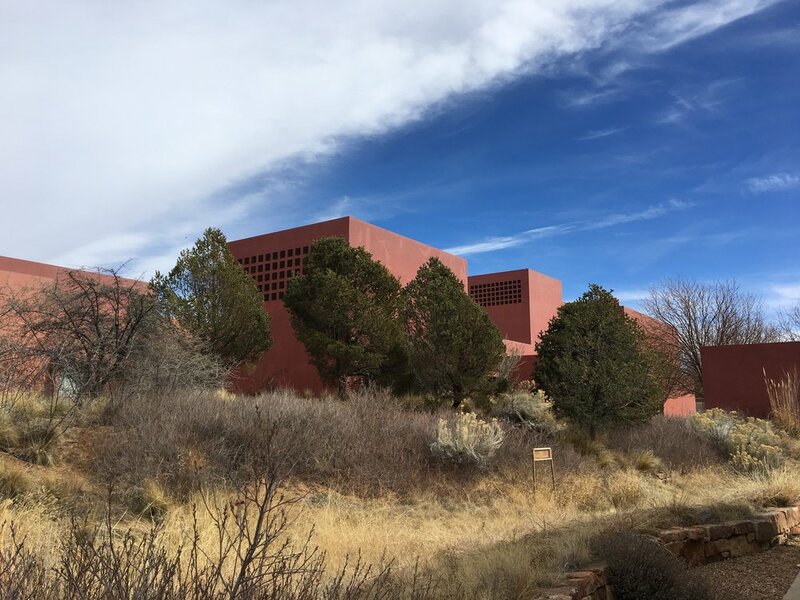 I'm thrilled to be an artist-in-residence at the Santa Fe Art Institute throughout the month of March 2018. If you're in the area, please stop by! Today is the last day of Please Interrupt If You Don't Understand, my inaugural solo exhibition. I'm so grateful to A R E A Gallery and the Walter Feldman Fellowship at the Arts and Business Council of Greater Boston for making this exhibition possible. The gallery is open today, Saturday, October 14, noon - 6:00pm at 289 Columbia Street in Cambridge. Stop on by! I'm so thankful to everyone that has come to A R E A throughout the course of the exhibition! If you're in Boston this week, please join us this Wednesday, October 11, at 6:30 for May I Interrupt?, a discussion that explores language, culture, and its accessibility in the court system. Hope to see you there! I'm thrilled to announce my first solo exhibition, Please Interrupt If You Don't Understand, opening this Thursday, September 14, at 6:00 p.m. at A R E A in Cambridge, Massachusetts. If you're in the Boston area, I hope you can join us! This exhibition is made possible through the Walter Feldman Fellowship administered by the Arts and Business Council of Greater Boston. I'm looking forward to featuring work in the upcoming 4th SUR Biennial in Los Angeles as part of DisPlaced: Reconstituted Memories and Unsituated Bodies, opening at the Cerritos College Art Gallery in Norwalk, California on Tuesday, September 12 at 5:00 p.m. Comprised of seven independently-curated exhibitions and held in conjunction with the Getty's Pacific Standard Time, the Biennial integrates the work of artists in Southern California and beyond that considers Latin American cultures and histories. Need an escape from the summer heat? Please join me next Wednesday, July 12, at Haley House in Roxbury for a special evening with these three brilliant artists! I'm thrilled to be featured in I Come From Where the Palm Tree Grows at the LATLab at 1933 S. Broadway in Los Angeles. The exhibition, comprised of work by both Cuban and Cuban-American artists, remains open until July 8. I hope you can stop by! I'm honored to show new work as part of Koan at iArtColony in Rockport, Mass. If you missed the opening, the exhibition will be up until July 4. You can find the venue in the big red house at 42 Broadway! Thanks to everyone who joined us last week at the opening of El Acercamiento at La Fábrica de Arte Cubano, including U.S. Ambassador Jeffrey DeLaurentis. Most of all, thanks to Evelyn Serrano for launching El Acercamiento into existence. Your brilliance and vision are unmatched. I'm packing my bags for Mass MoCA, where I'll be an artist-in-residence from February 24 - March 2. Will you be in town? Please stop by and say hello! I'm proud to have curated part of Re.vol.ting, a group exhibition in protest of Donald Trump's inauguration. If you're in Boston January 20, please join us in solidarity! I'm honored to have curated a part of the upcoming exhibition "Stark Naked: Uncovering Bodies, Objects, and the Futility of Desire," on view at the at the Gallery Kayafas in Boston tomorrow, Sunday October 16 from 7:00 - 10:00pm, featuring the talented Patricia Suau, Danica Arimany, Bryana Siobhan, Ana Treviño, and Anthony Young. I hope you can join us!